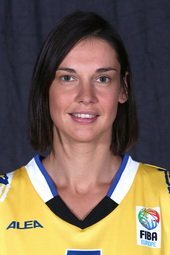 The professional career in playing basketball for Sandra Le Dréan will come to an end in Valenciennes on Saturday, 15 May 2010. Le Dréan who is currently playing for ZVVK USK Praha in the Czech Republic had already hinted last season that this could be her last season. However before she finally hangs up her basketball shoes, she has a few matches left with her club as they take on Frisco Sika Brno in the Czech Republic in the best-of-5 championship series which starts on Wednesday, 14 April 2010. In her career in France, Le Dréan won all the domestic honours and personal awards. She also won the EuroLeague Women competition twice and played in the first EuroLeague Women All Star Game. She has continued her winning habit with ZVVK USK Praha. This season Le Dréan added the Czech Cup to her collection with her side beating Frisco Sika Brno (99-96) in the final. Le Dréan ended her international career with the French national team in 2008 after playing 214 games and scoring 1651 points. For her final game, Le Dréan has organised a gala event to be staged in France at the former home of USVO. She has invited former team-mates from all the clubs she has played for during her career including members from the French national team to participate in this match between her team and a LFB select. The game will be played at 19:00 CET (17:00 GMT). The doors will open at 17:00 and at 17:30 the players will be available for autographs. The price of admission is 5 Euro.